A couple of weeks ago, we shared the first Hellmann’s® “Chicken Change-Up” Challenge – our time-saving recipe for BBQ Cheddar Crusted Chicken, which was oh-so good. This week we’re faced with a new challenge – finding something to feed picky eaters – those kids (or even adults) who are very selective in what they eat. For this challenge, we’re looking at how we can cook a delicious chicken meal that everyone will love, and really, who doesn’t love Chicken Parmesan? Chicken Parmesan has a little something for everyone – a nice breading, tomato sauce, and topped with cheese – yum. Didn’t that look delicious. The entire meal took less than 30 minutes to prep and cook, which is great for families and parents that don’t have much time. And it came out so good that there wasn’t a single word against the dish. All eaters gobbled up the chicken happily with “yums”. With this Hellmann’s Chicken Parmesan recipe, you can make the moistest Chicken Parmesan ever, and it will taste like it is from a restaurant. After eating it, I seriously wondered if using Hellmann’s was the secret trick that restaurant have been using but don’t tell you. Fortunately you can make this restaurant-quality meal without a restaurant price. A meal of Chicken Parmesan for 4 costs about $8.36, which comes to ~$2.09 per serving. Way more affordable than eating out, don’t you think? If you’re excited about chicken, or want to find more recipes or information about Hellmann’s Chicken Change Up, head over to the Hellmann’s Facebook page. You’ll find reviews and advice for dinnertime challenges, as as well as a sweepstakes and daily giveaway! Enter to win one of their daily prizes or even a $5,000 grocery store gift card. Looks yummy, and I always like cooking when it’s quick and easy. Looks tasty! I like the idea of spreading the mayo onto the chicken in the plastic bag, like you did. Much less mess. Thanks. 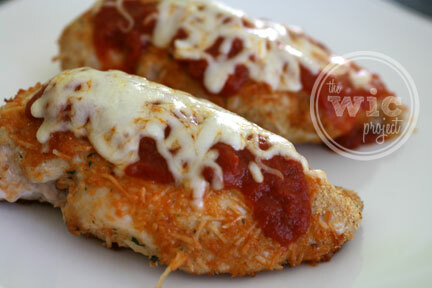 This recipe for making Chicken Parmesan is easy and looks delicious! I always need ideas when making something different with Chicken and this is a great recipe to try! It looks delicious. Great ideas. I’ve never made anything like that. Now that I know how easy it is, I will.